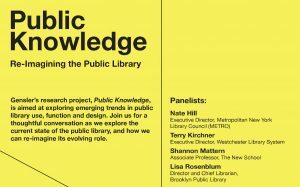 I organized a panel on library tech developments for the Mobility Shifts conference at The New School, and I was fortunate to gather a fantastic group of experts — Kim Dulin from the Harvard Library Innovation Lab; Deanna Lee, VP of Communication at the NYPL; and Linda E. Johnson, Interim Director of the Brooklyn Public Library — to take part. Here’s an audio recording of our conversation. The panel took place on Friday, October 13, from 4 to 6pm in the Theresa Lang Center, on the 2nd floor at 55 West 13th Street. America’s public libraries, as the dominant narrative goes, afforded all people “the means of acquiring knowledge, self-education, [and] culture” (Oscar Bluemner, 1898). Libraries, in their dual – and often precariously balanced – commitments to cultural uplift and cultural outreach, have long been, at least in theory, places of self-directed, DIY learning. As materials once available only in the stacks have become ever more accessible in people’s homes and in their pockets, libraries’ strategies for cultural outreach, and for supporting patrons’ self-education, have evolved. Libraries are developing new ways for patrons to access their collections; drawing attention to underutilized collections; and helping users filter and contextualize material. Meanwhile, international organizations are using technology to bring libraries to regions of the world where they’d been scarce. And many of these initiatives are creating new opportunities for patrons to do things with or contribute to material in libraries’ collections. Recent library-led technology development projects have attracted attention. As Alexis Madrigal wrote on The Atlantic’s website in June 2011, the New York Public Library “has reevaluated its role within the Internet information ecosystem and found a set of new identities” – as a “social network with three million active users” and as a “media outfit,” a “beacon in the carcass-strewn content landscape.” This panel examines how three different institutions – two public libraries and an academic library research unit – are helping to reshape the information ecosystem and creating new roles for themselves within it. Kim Dulin from the Harvard Library Innovation Lab will discuss their work in developing a front-end web application, a “virtual front door,” for the proposed Digital Public Library of America (DPLA). As Dulin notes, this interface will allow the DPLA to become more than “just a collection”; it will be “a place users can go to discover works, engage with them, engage with one another, and share what they learn, know, and care about.” Deanna Lee, of the New York Public Library, will address several recent digital initiatives – the Biblion application, a John Cage “living archive,” a crowdsourced historical menu transcription project, and a new, more interactive library catalogue – that likewise change the ways and places in which patrons can access, experience, organize, and contribute to the collections. Linda E. Johnson will address the Brooklyn Public Library’s Broadband Technology and Opportunities Program and other of the library’s digital literacy initiatives. Finally, Shannon Mattern will identify common threads in the panelists’ presentations and offer prompts for discussion, which will address (1) how these projects provide opportunities for self-directed learning in new contexts; (2) how they evidence new thinking about pedagogy and epistemology; and (3) what the challenges and limitations of these projects might be, particularly as we attempt to implement them among traditionally underserviced populations and in the developing world.